In May 2005 we sailed 2400 miles from the Virgin Islands to the Azores, a lovely group of 9 volcanic islands located 800 miles west of Portugal. 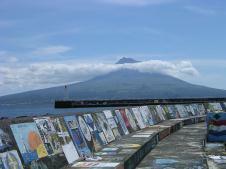 We spent 3 weeks exploring Pico, Faial and Sao Jorge before sailing on to Ireland. Seven days later, at daybreak we sailed by the famous Fastnet Rock Lighthouse and made landfall at Kinsale, Ireland. We worked our way up the coast, visiting Dublin and Belfast before sailing on to Scotland for the summer months. 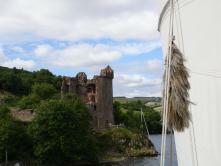 We spent two months exploring the West Coast and the Inner Hebrides, as well as traveling the full length of the Calendonian Canal to Inverness and back. 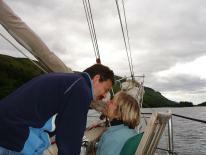 We spent a week in Loch Ness and visited several Scottish friends. In September we sailed back to Ireland and then on to Cascais, Portugal. We spent a month sailing down the coast and along the Algarve region before heading offshore to Madeira. From Madeira we sailed to the Canary Islands and then the 21 day offshore voyage back to the Grenadines for the winter charter season. For eight years, in early November we would make the offshore passage from New England to the Virgin Islands. Each winter season we traveled extensively up and down the chain of islands from the British Virgin Islands to Grenada. 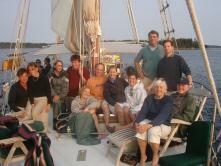 Our charters were usually 1-2 weeks, but we once had a family of six onboard for three months. We slowly worked our way from Grenada through most of the islands to Culebra. 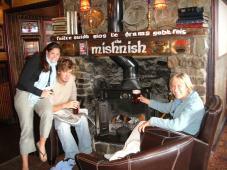 Several charter guests would come back year after year, each time exploring a new group of islands. We also brought hundreds of childrens books down to some of the islands in the Grenadines (most often Mayreau). The fishing between the islands provided us with Mahi-Mahi, Tuna and Wahoo. In early May we would make the offshore passage back to the East Coast, usually making landfall in Newport, RI and then heading home to Maine. Aside from the summer spent in Scotland, we are normally chartering in Maine and occasionally Nova Scotia and Cape Breton. We have participated in several Tall Ships events. The largest being, Sail Boston 2000, where over 140 tall ships gathered to celebrate the Millenium. We proudly sailed with the flotilla to the head of Boston Harbor and back to our birth. It was a magnificient gathering of some of the lovliest sailing vessels in the world. We have seen hundreds of incredibly beautiful islands and explored thousands of miles of fascinating coastline, but none are any more magnificent than our home waters of Penobscot Bay. There are over 800 islands along the rugged coast of Maine. It offers some of the best sailing in the world. Each year we explore new harbors and anchorages. No where in the world will you see more windjammers under full sail. Whether you want to meet some of the local island characters, find the most secluded harbor, or spend the day seeing how many sails we can fly, we can offer you a most unique vacation experience. Come see for yourself why Maine is still our favorite place to cruise. It just doesn't get any prettier. 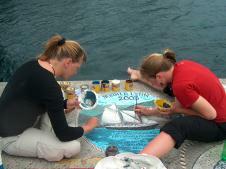 Two of our crew creating a true masterpiece on the dock.